Having AchieveIt helps us do that documentation in a quick, efficient way has been revolutionary in terms of being able to refocus on our core objectives. The stakes are high with organ transplants. One of the most important and inspiring areas of healthcare delivery is Organ Transplant and Procurement. 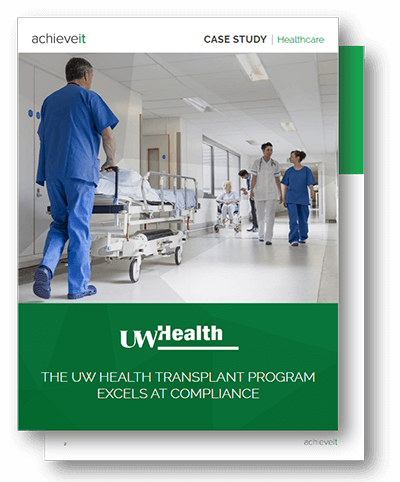 Since there are upwards of 130,000 people on waiting lists and only 15,000 organs available each year, the UW Health Transplant Program must do all it can to increase the success and benefit of transplantation. Before AchieveIt, UW Health’s teams used Excel spreadsheets to track the projects and complex documentation they were working on. However, the day-to-day complexity of their efforts and density of their compliance legislation paperwork made it near impossible to monitor, prioritize, and execute beyond the day-to-day. Dina Steinberger, the program’s Director of Performance Improvement, knew that if they were going to successfully prioritize their long-term improvement initiatives, they needed something that could lighten the workload for everyone. The transplant program now uses AchieveIt to provide structure to their many tasks, ease the burden of Center for Medicare and Medicaid Services (CMS) documentation, and add transparency to all aspects of their Performance Improvement programs. AchieveIt makes it easy to brainstorm and prioritize initiatives in compliance with CMS’s design and scope requirement. Custom dashboards with live updates ensure the team has the data they need to monitor the program, keep efforts compliant with CMS standards, and be able to quickly address potential concerns along the way. AchieveIt has alleviated the administrative burden of compliance documentation, which allowed them to keep the focus on patient care. Perhaps more importantly, AchieveIt has also improved organizational transparency for both internal teams and external CMS Surveyors. Learn how this medical transplant program used AchieveIt to revolutionize their compliance processes to stay Medicare and Medicaid compliant.